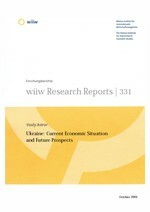 Ukraine's recent political developments have been rather turbulent and their effects on the economy controversial. The economy was rapidly growing between 2000 and 2004, albeit starting from a very low base. Among the growth factors were the devaluation of the hryvnia in 1999, the rising demand in Russia, other CIS markets and Asia, high world market prices of steel and a dramatic upswing in domestic demand for capital goods. Yet in 2005 economic growth slowed down dramatically, as the investment climate suffered from a re-privatization campaign, the world steel prices plunged, while imports were fostered by increased social spending and the currency revaluation undertaken. Newly available data show that the economic slowdown has reversed recently. Private consumption gained momentum once again, backed by an impressive growth of money incomes of households and expanding bank lending. The new Yanukovych government appears to be returning to the more liberal course pursued prior to the Orange Revolution: cutting the corporate profit tax, re-instating the Special Economic Zones and shifting the social insurance burden from employers to employees. The consolidated deficit envisaged by the 2007 budget draft (2.6% of GDP) is to be covered largely by privatization receipts. Foreign trade developments during the past one and a half decades have been generally characterized by a re-orientation of trade flows away from Russia and the CIS. However, Ukraine's trade and integration relations with the EU have not advanced very much. The Partnership and Co-operation Agreement envisages the formation of a free trade area with the EU only after the Ukraine has joined the WTO; the latter seems now likely to be delayed and synchronized with that of Russia. The project of a Common Economic Space (CES) between Ukraine, Russia, Belarus and Kazakhstan - agreed upon in September 2003 - remains largely on paper as well. Ukraine has scarce reserves of fossil fuels but an extremely energy-intensive economy. In order to reduce the energy dependence on Russia, the 'Energy Strategy of Ukraine until 2030' aims at using more nuclear power and domestically produced coal. An even better recipe in solving the country's energy problems would be a large-scale implementation of energy-saving technologies, including those brought by foreign investors. However, until now the FDI flows into Ukraine have been rather disappointing. The EU-15 share in Ukraine's FDI stock stood at 58% by the end of 2005. The relative political stability following the formation of the new government in the summer of 2006 is likely to bring benefits in the form of increasing investments and higher economic growth. The relations with Russia will almost certainly improve. Further price hikes for imported natural gas are likely to be gradual so that their impact on Ukraine's economy will probably be smoothed. The expected economic growth is 6.5% in 2006 and 7% next year, with annual consumer price inflation hovering around 10%. The recent upturn in exports implies that the trade and the current account deficits will be relatively small. In the longer run, a diversification of the economic structure away from metals and chemicals, and towards goods with a higher value-added, accompanied by an implementation of energy-saving measures, will be essential for ensuring the sustainability of economic growth.